• Suitable for teaching and training laboratories (i.e. 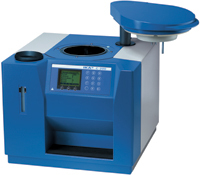 technical schools, universities) as well as for industrial laboratories where reduced sample analyses is required. • Manual handling for water and oxygen filling. • Validation according to DIN 51900, ISO 1928, ASTM D240, ASTM D4809, ASTM D5865, ASTM D1989, ASTM D5468, ASTM E711.